This product is not exactly the first of its type, but it is a relatively rare beast. Sets from such companies as Preiser, Legio and Eduard have produced figures in deliberately multiple parts, but this is perhaps the first major set to provide what amounts to a kit of parts where the customer has complete freedom to assemble whatever figure they wish. This is a concept that is familiar to products in larger scales, and many will remember the enormous range of parts made by Historex of France, but in the small scale of 1/72 some of the problems of this approach are magnified, so in many ways this is an interesting new twist. Caesar produced several such sets simultaneously, all depicting German subjects from World War II, of which this, purely numerically, is the first. It seems appropriate to begin by describing exactly what you get in the box, which should be seen in conjunction with our image of the sprue. Essentially you get a maximum of 16 figures, each of which is made up of at least seven parts, being the body, left and right leg, left and right arm, face and headwear (plus the base if required). To that must be added all the optional extras such as weaponry or other items for the hands, ammunition pouches and assorted items of kit that these men would carry into battle. A figure with 15 different components is perfectly possible, although of course exactly how well any figure is equipped, and therefore how many parts they need, is down to the wishes of the customer. Apart from the basic body parts there is a range of weapons, pouches, entrenching tools, bread bags, canteens, map cases, capes/shelters, gasmask cannisters, holsters and binoculars; pretty much everything except the largest packs and more specialist equipment such as flamethrowers etc. All these items are in abundance, although not necessarily enough for every figure to have the same weapon, for instance. Nonetheless the range is pretty good, and you couldn't really ask for much more. Given the complete freedom to make whatever pose you can with the pieces, we have simply put together one representative sample to give an idea of what the end result looks like. We did experiment with these pieces, but were surprised to find it was actually quite hard to achieve a really good pose - clearly you are limited by the arms and legs provided. Those with the inclination and skills will doubtless be able to make much more of what is on offer by converting, and perhaps also use this set as a spares box for other projects, but we felt it would take a long time and a lot of trial and error to obtain specific desired poses. Then of course if you want to make up all 16 figures then you will eventually be left with the last limbs in the box, which may not combine into a particularly good figure. The scope is certainly there, but it will take time to decide what poses you want. We did find that the figures were relatively simple to put together. They are made of a hard plastic so take ordinary cement very well, although naturally there is no getting away from the fact that this is fiddly work that will not appeal to all. Without making any adjustments we found the different legs matched well, as did the bodies and arms, but inevitably there is going to be a less than perfect join which you wouldn't get with a one-piece figure. However the fit is very good so that will not cause anyone any problems. A well-equipped soldier will require a lot of pieces, and the customer will have to arrange them as they wish, which for many will be appealing. However all the bodies come with just the basic waist belt and 'Y' shaped straps, so none require any extra kit. This also means any kit you do add has no straps to 'support' it. The sculpting is very good, with lots of crisp, sharp detail. The quality is at least as good as Preiser, which is about the nearest equivalent product. The weapons are perhaps not quite as sharp as the German company, but still pretty good and certainly better than some of the soft plastic sets Caesar have made. There is no flash anywhere, but you do need to be careful when cutting off small items as the hard plastic can fracture if not handled properly. A lot of the accuracy considerations revolve around the weapons and kit, which here is entirely down to personal preference. All the torsos are essentially the same, so all the potential figures are dressed alike, but are fine for the period in question. 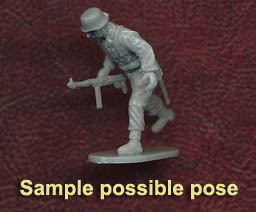 Everything on the weapons sprue is also appropriate, so no problems with authenticity here. Our description and a look at the image of the sprue will probably tell you whether a set like this seems like a wonderful opportunity to experiment or just too much like hard work. Certainly this approach is not a very efficient way to build up large numbers of figures, and as they are hard plastic with many thin extremities they will not be the most robust of figures. If you are putting together a very specific scene then this is probably exactly what you are looking for, and particularly if you can do the necessary work to create exactly what you want from these components. For others this product probably has little to offer, but that was always going to be the case. In conclusion, the parts are well made and fit together well, the accuracy is good and the potential virtually limitless. If you like the basic idea then this is probably about as good as you could expect such a set to be.